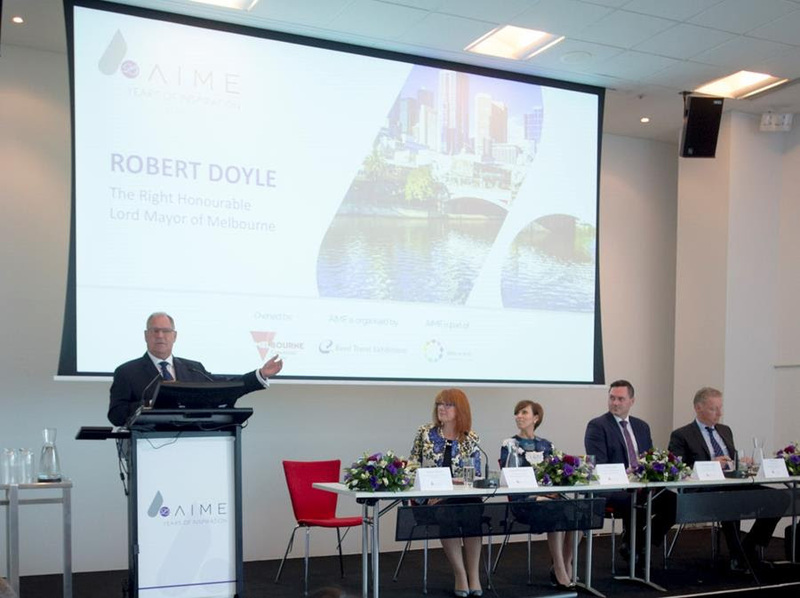 The Asia-Pacific Incentives & Meetings Expo (AIME) press conference has launched the silver anniversary of AIME, at the Melbourne Convention & Exhibition Centre (MCEC) on Monday 20 February 2017, announcing new research and insights driving the meetings and events industry. The Right Honourable Robert Doyle, Lord Mayor of Melbourne, remarked on Melbourne’s position as Australia’s sporting capital and the world’s most liveable city for the sixth consecutive year, plus the city’s friendly and down to earth charm. Karen Bolinger, CEO, Melbourne Convention Bureau outlined the future of the meetings and events industry in Australia, sharing findings from The Future of Business Meetings Industry Report by McCrindle on the expectations and changes to the industry. “Attendees are no longer content to sit, listen and simply absorb information, they are looking for an opportunity to actively participate and collaborate. 76% agree that integrating fun into a conference experience is not just a nice to have, but essential for conferences today. In the next 15 years, we can expect elements of business events to get shorter, the length of networking time is the only area of business events expected to increase,” said Ms Bolinger. “Technology is not taking away from the conference experience, it is enhancing it. By 2025, more than half of the workforce will be comprised of Generation Y and Z. Over the next decade, Australia will experience its biggest intergenerational leadership ever. 92% bringing with them an expectation for technology to be integrated throughout an event,” said Ms Bolinger. Penny Lion, Executive General Manager Events, Tourism Australia shared Australian events contributed approximately $55 million to the Australian economy in 2016, with a 100% satisfaction rate. Ian Wainwright, Event Director – AIME, Reed Travel Exhibitions shared his excitement over the 25th Anniversary. “This year brings us the most diverse and valuable pool of visitors, buyers, speakers, suppliers and experts from all over the region. The buying power of Hosted Buyers this year exceeds 1.2 billion Australian dollars, and that is just the start of the value of doing business at AIME. “The quality of our 25 year anniversary program is truly spectacular, and we’re proud to be part of this industry leading event. The future of AIME is bright. AIME is where inspiration has begun for 25 years, and I look forward to seeing where this inspiration takes us,” said Mr Wainwright. Concluding the press conference, Peter King, Chief Executive of Melbourne Convention and Exhibition Centre, talked of the venue’s success over the last year and the continued growth of MCEC as the first six-star facility in Australia. Speakers at the press conference included the Right Honourable Robert Doyle - Lord Mayor of Melbourne; Karen Bolinger - Chief Executive Officer, Melbourne Convention Bureau; Penny Lion - General Manager Events, Tourism Australia; Peter King - Chief Executive, MCEC and Ian Wainwright - Director – AIME, Reed Travel Exhibitions Event. AIME, 21 – 22 February 2017 at the Melbourne Convention & Exhibition Centre will unite a community of event professionals for two powerful days of networking, education and business.